Everyone loves misjudging the weather, then spending the day sweating or shivering in their unsuitable clothes, right? Wrong. The process of endothermy, by which humans expend energy to approach an ideal body temperature, can make wearing inadequate clothing uncomfortable. A team of researchers has completed a project that they believe may address this issue. The result of this study is a form of fabric that should help the wearer lose heat when the ambient temperature is too high and conserve heat when it drops. This is known as dual-mode passive radiation, and requires no additional external energy to work. The scientists behind this material claim that it can change a wearer’s immediate temperature by as much as 6.5⁰C. Endothermy is a complex process underlined by a number of autonomous functions such as those that result in shivering or goosebumps. However, humans still often find natural endothermy unsatisfactory, and have therefore developed clothing and indoor environmental systems that keep us at comfortable temperatures. However, these adaptations can be expensive in terms of resources and energy. On the other hand, it is preferable to the effects of exposure to extreme temperatures. In addition, sudden temperature fluctuations over a relatively short period of time may increase the risk of respiratory and, according to some research, possibly cardiovascular, illness. Therefore, some researchers believe that personal or immediate temperature control needs to become even more efficient. Furthermore, novel fabrics that can be made into clothes that deliver this are often seen as the most energy-efficient pathway to this goal. Body temperature is lost in terms of infrared radiation (or electrothermal energy). Fabrics or textiles that have been developed to conserve it, or reflect it back at the wearer, contain adaptations such as coatings of metallic nano-wires. However, if the ambient temperature increased rapidly, this would not be quite as helpful to the wearer. Therefore, materials that also radiate heat in response to external temperature increases would also be useful in many situations. Nanoporous polyethylene (PE) has been shown to allow the passage of infrared through it. This substance forms pores as much as 1000nm apart; therefore, it is not transparent to the human eye. Laboratory-based simulations have shown that cloth made of nano-PE can reduce skin temperature by up to 2.7⁰C compared to a conventional cotton fabric. However, in terms of temperature-control clothing, it would still only perform one of two necessary functions; therefore, the same item of clothing can’t be used in conditions of unpredictable ambient heat levels. Scientists such as Yi Cui believe that garments that can adapt to both increased and decreased external temperatures can benefit energy resource use in some settings. Cui, a researcher from the Stanford Institute for Materials and Energy Sciences, formed a team of researchers from this institution and the departments of Materials Science and Engineering, Electrical Engineering and Mechanical Engineering at Stanford to investigate the possibilities of a single fabric that could be used to radiate heat and reflect it back under different conditions. The fabric they came up with was a multi-layer construction, two of which was made of nano-PE. They formed the surface of the new textile, which also contained two additional layers of ‘high-emitting’ and ‘low-emitting’ material. The ‘low emitter’ layer faced a thin layer of nano-polyethylene, whereas the ‘high-emitter’ faced a thicker layer of the same. Therefore, heat could radiate quickly and efficiently through the fabric when the thinner nano-PE layer would be in contact with skin, and vice versa. In other words, the fabric had two different coefficients of heat transfer, depending on which side of it was turned towards a heat source (i.e. human skin). The researchers estimated that the heat loss through the fabric would be comparable to that of nano-PE fabric alone, provided that the emissivity and thermal resistance of the skin in question was equal to that of the fabric. On the other hand, turning the fabric the other way should reduce its thermal conductivity considerably. 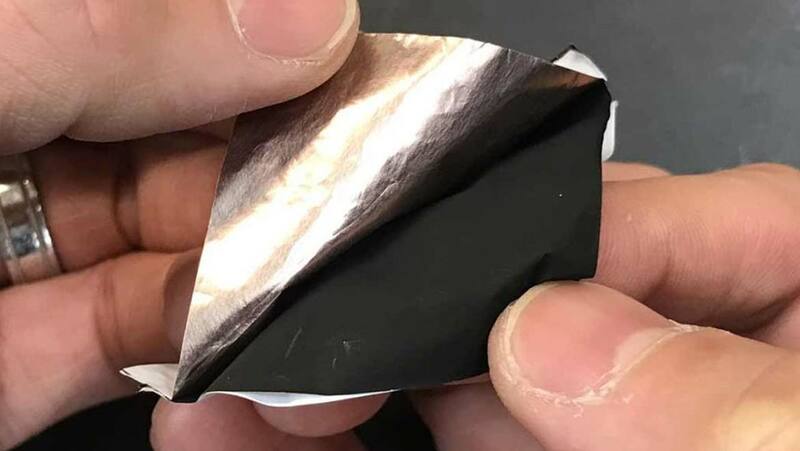 The researchers chose thin layers of carbon (9µm) and copper (0.15µm) as the high-emitter and low-emitter layers respectively. One nano-PE layer was 12 µm thick, and the other was three times thicker. The copper layer had an emissivity of approximately 0.3 and the carbon layer exhibited a value of about 0.9. By comparison, the human body has an average emissivity of about 0.894 at 33⁰C. The team tested their fabric on an artificial skin simulator (an acrylic chamber kept at a consistent temperature using a water-powered heating/cooling system). Conventional cloth in the form of a commercially-available sweatshirt increased its temperature from 31⁰C to 36.9⁰C. The team then applied their fabric to the simulator with the high-emitter layer facing away from it. This resulted in a 3.1⁰C reduction in temperature. The fabric was then flipped the other way and applied to the simulator again, which resulted in a 6.5⁰C increase. The team also applied their fabric to a ‘sweating hotplate’ to demonstrate its performance in response to the presence of moisture and its evaporation. They found that the heat-loss coefficient of the ‘cooling’ side still remained higher (by 10%) that that of the ‘heating’ side. The team also claimed that the fabric’s favourable properties were maintained under various conditions, such as varying thicknesses of the ‘emitter’ layers and the way in which the nano-PE layers were woven. They also documented the fabric’s appreciable durability after washing in their article based on this work, published in Science Advances. Fabrics such as these may be useful in products such as outerwear intended to be worn in very changeable or extreme conditions. It may be also relatively cheap to produce; the materials of the ‘emitter’ layers could be substituted for materials with similar emissivity (e.g. silicon dioxide). On the other hand, little is known about how textiles such as nano-PE hold up in the real world, and there are many people were are averse to wearing all-synthetic fibres. In general, it is not clear if these heat-adaptive fabrics are the future. Hsu P-C, Liu C, Song AY, Zhang Z, Peng Y, Xie J, et al. (2017) A dual-mode textile for human body radiative heating and cooling. Science Advances. 3:(11). Heunis JC, Olivier J, Bourne DE. (1995) Short-term relationships between winter temperatures and cardiac disease mortality in Cape Town. South African medical journal = Suid-Afrikaanse tydskrif vir geneeskunde. 85:(10). pp.1016-9. Inactivity Or Hypoxia: Which Is Worse For Astronaut Muscle?